Outlier Media is a Detroit-based service journalism organization. We identify, report, and deliver valuable information that helps residents create more accountability around the housing and utility issues they care about. Service journalism is a news consumer-oriented approach to identifying information needs, building trust with news consumers, and creating accountability. By keeping residents first, we hope to give more than we take, and leave people with the information they need to create change and accountability in their own communities. We send personalized data over SMS text to Detroit news consumers. The text snapshot below shows what an early interaction between Outlier and a resident looks like from our end. If you want to try it yourself txt the word OUTLIER to 73224. After this chatbot driven interaction we invite each of our news consumers to talk directly with a journalist. About 40% of our users take us up on this offer. They ask questions about housing, taxes, or utilities and we report out the answers for them. These conversations drive our deeper-dive accountability and investigative work and are published in community, local, or national news outlets. It does! 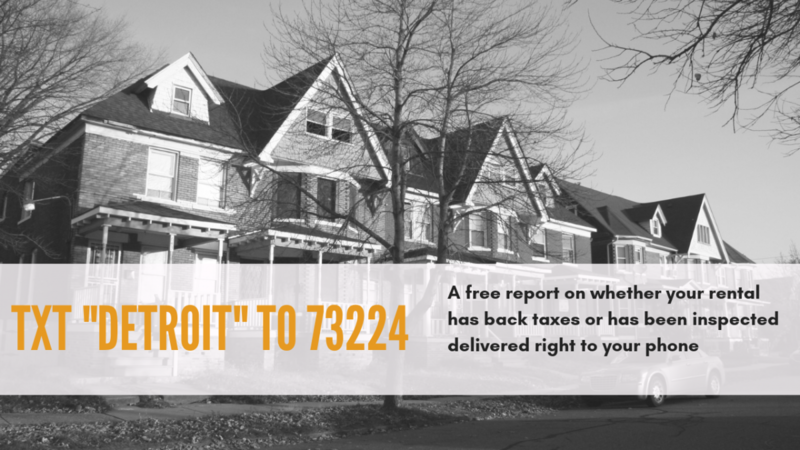 Outlier reaches roughly 400 Detroiters each week with valuable housing and utilities information. Consistently, 40% of our users ask for a personalized follow up. This means we are in regular conversation with more Detroiters than newsrooms many times our size. Our consumers are empowered to make important decisions to protect their families, avoid tax foreclosure and evictions, purchase new properties, and determine the most cost-efficient energy resource for their households. Our individual engagement with residents has allowed dozens of residents to navigate or avoid altogether eviction, foreclosure or utility shut offs. Our broader based accountability reporting has led to local changes in policies and practice in rental inspections, and the county’s tax foreclosure auction. WHY DID YOU CHOOSE HOUSING AND UTILITIES? When we decided to launch Outlier, our team used call center data from United Way’s 211 service to identify the issues Detroiters frequently ask for help with. Given the national housing foreclosure crisis, years of economic disinvestment, and the largest municipal bankruptcy in US history, the data revealed residents’ top priority revolved around housing. This became Outlier’s first area of interest. The second most reported inquiry was utilities. As a result, Outlier recently added a second focus around utilities. We are looking forward to providing news consumers with the information they need to navigate loosely regulated utility companies and agencies. WHAT IF I NEED MORE OR DIFFERENT INFORMATION? Outlier is willing to look into any housing, property tax or utility question you might have. To get in touch with an Outlier journalist, contact info@outliermedia.org, or just tell us to “FOLLOW UP” with you when you text Detroit to 73224. WHAT ARE SOME OF OUTLIER’S DATA SOURCES? Outlier Media makes decisions about how and where to focus our reporting resources based on where we see information and accountability gaps for Detroiters. We do not make decisions about what to cover based on anything else, including the opinions of our donors or supporters. This “firewall” is part of what keeps us editorially independent. We accept donations and grants from individuals and foundations but we do not make reporting decisions based on this support. News judgments are made independently. Outlier does not accept donations from government sources, political parties, elected officials, candidates seeking public office or groups likely to intersect with our reporting as sources or subjects. Outlier Media does not accept funding where an NDA is required. Outlier journalists do not accept gifts or favors of more than nominal value, nor any special treatment, from any person or group that is or could be a source or the subject of our reporting. We follow the conflict of interest policy of our fiscal sponsor, Investigative Reporters and Editors. DOES OUTLIER EXIST IN OTHER CITIES? Outlier is proud to call Detroit home. We also encourage others beyond The Motor City, especially journalists and foundations, to utilize this framework to connect residents with the information they need and value. HOW DOES OUTLIER MAKE MONEY? Outlier is a fiscally sponsored project of Investigative Reporters and Editors. Over the years, we have been supported by grants from the Kellogg Foundation, the Community Foundation of Southeast Michigan, Democracy Fund, and the News Integrity Initiative. If you would like to support Outlier’s work, we encourage you to click on the DONATE button on your desktop or mobile device.